"Are you sure it's not deliberate?" That was my reaction when I heard that the spectacular sunflower seed installation by Chinese conceptual artist Ai Weiwei has been cordoned off for health and safety reasons. It's an installation of 100 million sunflower seeds each hand-crafted in porcelain and painted by a Chinese worker - "an image of globalisation both politically powerful and hauntingly beautiful" writes Adrian Searle in a five star Guardian review. 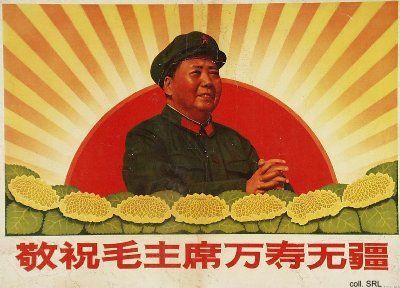 When Mao was in power sunflowers were ubiquitous features on propaganda posters, with Mao as the sun to which the flowers all turned. There are a lot of tongues tsk-tsking that British obsession with health and safety has ruined the interactive nature of Weiwei's installation. Seems to me it adds another layer to the piece. Here is a roomful of sunflower seeds, made in China. I grew up in Southeast Asia, and to me the installation represents the collective identity - the We mentality of the East contrasted against the Me-myself-and-I of the West. When the barriers went up, I wondered if this was what Weiwei intended - to represent the Western response to such a show of collectivity. Far from being a disappointment the health and safety barriers represent the ultimate in interactivity - revealing how one culture processes another. Perhaps Weiwei planned it all along. Auto-tuning the news - how marvelous!